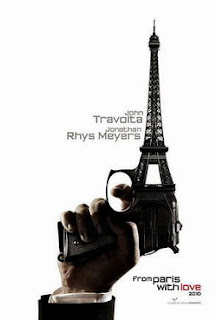 From Paris With Love concerns the forced pairing of a straight-laced ambassador's aide (Jonathan Rhys Meyers) with a wildcard secret agent (John Travolta) as they strong-arm their way through the Paris underworld. There's something about a terrorist attack and a cocaine deal and a conference of diplomats, but I couldn't quite nail it all down. Of course, coherence of plot is not the reason people go to movies like this anyway—they go for the action and hope for a few jokes. And, more or less, that's what you'll get here. The fight scenes are choreographed to the point of nonsense, but Travolta and Meyers seem honestly amused as they attempt to crack each other up for an hour and a half, and more than a couple of things explode. No doubt, opinions about such a film are going to be divided. From a critical standpoint, the movie is hollow, cliché and nonsensical—but the sense of fun is there nonetheless. There's the impression that no one was taking this thing seriously, a levity which can be contagious, though I'm not sure the screenwriter was in on the joke. Hoping to steer the viewer from pondering such things, the rapid-fire editing careens us from shootout to shootout at a pace that allows no time for analytical thought. 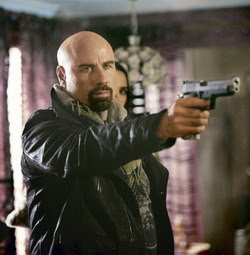 Say what you will about the ups and downs of his career, John Travolta has an undeniable presence, and his presence is even more appreciable when he's the sole funny guy in a film full of "straight men". Sporting a bald head and goatee, his pairing with the lip-stachioed Meyers seems to strive for the classic buddy-movie mismatch, but it falls short of the chemistry that made Rush Hour (2002) the first in a trilogy. As I compare the two films, I can hear picture writer/producer Luc Besson salivating at the idea of a From Paris With Love franchise. Besson once was the king of movies like From Paris With Love. In the early '00s he was the preeminent money man behind a slew of action movies that were just a little better than straight-to-DVD: The Transporter (2002) and Kiss of the Dragon (2001) come to mind. As vehicles for a variety of action stars, such films serve their purpose and assuredly make their investors' money back quickly, but I sometimes wish Besson had more interest in returning to the gritty tableau that began his career. The Professional (1994) and La Femme Nikita (1990) were consummate examples of '90s action cinema, where characters had real stakes and action was rough and painful looking. I mentioned earlier that people don't go to action movies expecting a decent story anymore, and it's a sad truth. Perhaps there's just not enough money these days in putting decent screenwriting before slam-bang action. We seem to have forgotten that we can have our cake and eat it too. Though an embarrassingly entertaining diversion, From Paris With Love also reflects much of what is lacking in contemporary action films.